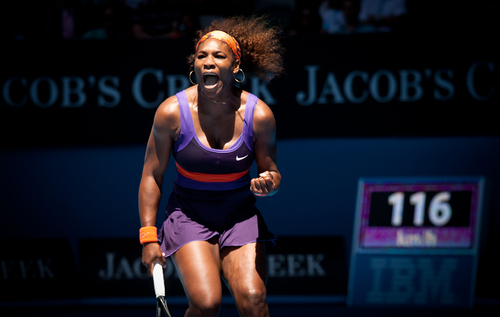 Tennis history was made today as Serena Williams defeated Maria Sharapova to win her 6th Australian Open. More importantly, Serena’s 19th Grand Slam singles title surpasses my childhood tennis icons Martina Navratilova and Chris Evert. This latest victory reminds me why Serena knows how to stand out and WIN – in tennis and in life. Since bursting onto the tennis scene in the late 1990s, Serena (as well as older sister Venus) knows what it is like to not fit in. In the hallowed halls of professional tennis, it’s rare to see top players who are black – not just from the United States, but from any country. Serena and Venus were outsiders who challenged the tennis establishment, and that’s why I gravitated to them. As an immigrant, racial minority and gay man, I root for anyone who stands out as different and still succeeds. And that’s what we can all learn from the Serena experience. While sports accomplishments brought her to our attention, Serena transcends the tennis court and is memorable to even non-tennis fans precisely because she stands out as herself. Serena shows that you can speak your mind – even as a woman. In a world where athletes – and especially female athletes – are often trained to give media-polite responses, Serena does not shy away from expressing her true opinions. Yes, she has sometimes stepped over the line (2009 and 2011 US Opens: how she yelled at a lineswoman and chair umpire was not warranted). But I want to live in a world where women feel empowered to speak their mind more, not less. Serena shows that you can pursue multiple passions – such as launching fashion and nail polish lines – rather than being boxed into just one of your interests. Serena shows that an athlete of any race can consistently win in any sport – as long as you have the talent and work hard. She is now judged by the quality of her matches, not the color of her skin. Serena shows that women don’t have to play sports with a soft touch; just like male athletes, they can exude fire and ferocity. Serena shows that a woman can flaunt – rather than shy away from – her physical strength. Serena shows that – although your path may be harder – you don’t have to fit into any expected mold in order to succeed. Even with history made today, I’m sure there’s already another milestone now in Serena’s sights: Steffi Graf’s impressive Open era record of 22 major titles. I, for one, am rooting for Serena to break that mark – while she continues to stand out and WIN.